On a search, I discovered that there was no thread as yet for #10... If I'm wrong, just go ahead and delete this. Alt text: "My most famous drawing, and one of the first I did for the site"
Salvador Dali wrote: Those who do not want to imitate anything, produce nothing. Simple Pen Art, now with an Archive page. Well, they had to include all the introductory mathematics, physics, grammar etc so that the following string could be translated. I think they actually did pretty well getting all of that into less than 14 million digits. If pi is an infinitely long string, then probability says we'd probably actually get this string in terms of numerical positions of the letters in the alphabet (ie A=1, H=8, Z=26 etc.). Internetmeme wrote: If pi is an infinitely long string, then probability says we'd probably actually get this string in terms of numerical positions of the letters in the alphabet (ie A=1, H=8, Z=26 etc.). You can't just concatenate the numbers together like that; there would be no way to distinguish between ABET (1 2 5 20 -> 12520) and LET (12 5 20 -> 12520), for example. It really should be encoded into UTF-8 * and located at an 8-bit boundary in the binary representation of pi. * Or, even better, EBCDIC. @Internetmeme: Pi is not an infinitely long string, only it's representation in our standard number system is. In reality (i.e. nature), its all there in an instance, and there is no problem and no infinity. And in the basic concept, that it is the result of the division of the perimeter by the diameter in a perfect circle, we already do make an abstraction, as there is no such thing as a perfect circle in nature. As so often, it is a topic produced by mathematics itself, which is an abstraction of nature, but neither covers it nor relates 1:1 to it where it relates at all. Surprisingly enough, a lot of results given by mathematical reasoning work out quite well if we use them to manipulate nature or build e.g. machines. And to be even more philosophical (yet, stay scientific and rational): Infinity is sth which is never obersavable and never reachable, as any attempt to realise e.g. all digits of Pi are of no avail. So infinity is a philosophical, but not a scientifically sound concept. It is one of these words concealing, that there is another final frontier to our abilities and understandings, but we won't admit it and therefore call it by a scientific name which pretends otherwise. Pi is exactly 3. See the bible, Kings 7:23 for proof. 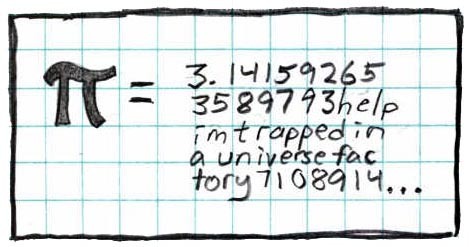 RogueCynic wrote: Pi is exactly 3. See the bible, Kings 7:23 for proof. Actually, the established Rabbinical interpretation is that the "error" is due to the difference in the inner and outer circumferences (the difference being the thickness of the rim) of a very large bowl (about 15 feet across.) And of course, it wasn't a mathematical treatise, but instructions on how big to make the bowl. That's actually pretty neat. The manual establishes that its brim was a hand breath thick; a 30 cubits inner circumference, 10 cu outer diameter means ~0.22 cu rim, which comes to about 10cm, if google (All praise be to him!) is to be trusted. But it's still an example of "communicating poorly", in that case.